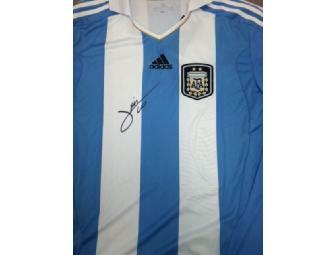 The shirt is signed by World Player of the Year and Argentina star, Lionel Messi and was donated by adidas which will provide confirmation that the signature is authentic. Your support matters, so Quinnipiac Soccer would like to use your information to keep in touch about things that may matter to you. If you choose to hear from Quinnipiac Soccer, we may contact you in the future about our ongoing efforts. Copyright © 2003-2019 Quinnipiac Soccer and BiddingForGood, Inc. All Rights Reserved. Designated trademarks and brands are the property of their respective owners.